With Fall around the corner and the better part of 2010 over, I wanted to see what the Top 30 Most Popular Books on Amazon.com are with the search term “Lean Six Sigma” (also bestselling books on Lean Six Sigma). PS: I receive a lot of free stuff, including lean and six sigma books. If you wish to send me free goodies, contact me. I was surprised to see some of the books on that list and there were some I’d never heard of before; so I’m glad for this list, for it introduced me to new authors on Lean Six Sigma and new content I otherwise wouldn’t have known. The Lean Six Sigma Pocket Toolbook blends Lean and Six Sigma tools and concepts, providing expert advice on how to determine which tool within a “family” is best for different purposes. Packed with detailed examples and step by step instructions, it’s the ideal handy reference guide to help Green and Black Belts make the transition from the classroom to the field. The core of the lean model remains the same in the new edition. All businesses must define the “value” that they produce as the product that best suits customer needs. The leaders must then identify and clarify the “value stream,” the nexus of actions to bring the product through problems solving, information management, and physical transformation tasks. Next, “lean enterprise” lines up suppliers with this value stream. “Flow” traces the product across departments. “Pull” then activates the flow as the business re-orients towards the pull of the customer’s needs. Finally, with the company reengineered towards its core value in a flow process, the business re-orients towards “perfection,” rooting out all the remaining muda (Japanese for “waste”) in the system. Value-stream mapping is an overarching tool that gives managers and executives a picture of the entire production process, showing both value and nonvalue-creating activities. Rather than taking a haphazard approach to lean implementation, value-stream mapping establishes a direction for the company. Value-stream maps are the blueprints for lean transformations and Learning to See is an easy-to-read, step-by-step instruction manual that teaches this valuable tool to anyone, regardless of his or her background. This groundbreaking workbook breaks down the important concepts of value-stream mapping into an easily grasped format. The workbook is filled with actual maps, as well as engaging diagrams and illustrations. To encourage you to become actively involved in the learning process, Learning to See contains a case study based on a fictional company, Acme Stamping. Using the information from the case study, you begin by mapping the current state of the value stream, looking for all the sources of waste. After identifying the waste, you draw a map of a leaner future state and a value-stream plan to guide implementation and review progress regularly. Written by Mike Rother and John Shook — two experts with practical experience — the workbook makes complicated concepts simple. It teaches you the reasons for introducing a mapping program and how it fits into a lean conversion. With this easy-to-use product, a company gets the tool it needs to understand and use value-stream mapping so it can eliminate waste in production processes. The new and revised edition of this modern day classic provides the critical piece that will make any lean transformation a dynamic continuous success. It shows you how to implement a transformation that cannot fail by developing a culture that will have all your stakeholders involved in the process and invested in the outcome. It will teach you how to build success from the top down and the bottom up at the same time. If you are a leader at any level in an organization undergoing or considering a lean transformation, this is where you should start and finish … and start again. Millions of readers remember The Goal, the landmark business novel that sets forth by way of story the essential principles of Eliyahu Goldratt’s innovative methods of production. Now, from the AGI-Goldratt Institute and Jeff Cox, the same creative writer who co-authored The Goal, comes VELOCITY, the book that reveals how to achieve outstanding bottom-line results by integrating the world’s three most powerful continuous improvement disciplines: Lean, Six Sigma, and Goldratt’s Theory of Constraints. Used by the United States Navy and United States Marine Corps to dramatically improve some of the most complex, logistically vast supply chains in the world, the VELOCITY APPROACH draws on the strengths of all three disciplines to deliver breakthrough performance gains. In physics, speed with direction is velocity; in business, the application of VELOCITY means your organization can achieve operational speed with strategic direction to outmaneuver competitors, gain loyalty with customers, and rapidly build sustainable earnings growth — in as little as one or two business quarters. Dee Jacob and Suzan Bergland, two princi-pals of AGI, have been teaching the concepts, techniques, and tools of VELOCITY to major corporations, including Procter & Gamble, ITT, and Northrop Grumman, for years. Now they unlock the door for you to see how to apply their insights and methods to your organization — be it business, not-for-profit, manufacturing, or service based — in order to shorten lead times, slash inventories, reduce production variability, and increase sales. Writer Jeff Cox returns with the vivid, realistic style that made The Goal so readable yet so edifying. Thrust into the presidency of the subsidiary company where she has managed sales and marketing, Amy Cieolara is mandated by her corporate superiors to implement Lean Six Sigma (LSS) in order to appease a key customer. Assigned to help her is LSS Master Black Belt Wayne Reese, installed as her operations manager. But as time goes on and corporate pressure mounts, Amy finds she has to start thinking for herself — and learning from everyone around her — and she arrives at the series of steps that form the core of the VELOCITY APPROACH. VELOCITY offers keen insight into the human and organizational factors that so often derail growth while teaching you proven, practical techniquesfor restarting and revving up the internal engines of your company to reach new levels of success. Colorful characters, believable situations, and everything from dice games to AGI’s “reality tree” techniques make this business novel a vital resource for everyone seeking to deliver business improvement in these challenging economic times — and far into the future. Lean Production Simplified is both enlightening and informative for all levels of lean learners. It is written from a very human perspective. Many prior publications focus on the lean bag of tools or the softer cultural aspects of lean. Dennis contribution is a well integrated blend of both giving the reader not only a systemic understanding of lean, but also the clear skill development required for leadership at all levels. Wherever you are on your journey to lean, Lean Production Simplified will provide further knowledge and insight to help achieve the next level on the eternal path to perfection. This book is just too important! In this age of global competition threatening to annihilate all but the very leanest, Pascal Dennis masterwork, Lean Production Simplified — A Plain-Language Guide to the Worlds Most Powerful Production System, is a must-read. 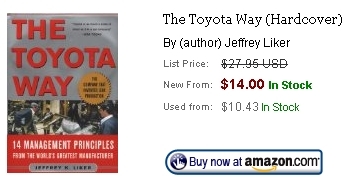 Midway through my career, after working at five, large North American manufacturing companies, its absolutely crystal clear that the three which died would have survived if only theyd known of and successfully implemented The Toyota Production System. Dennis is clearly North Americas Ohno-san! Much of the U.S. economy is now based on services rather than manufacturing. 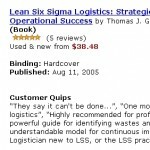 Yet the majority of books on Six Sigma and Lean–today’s major quality improvement initiatives–explain only how to implement these techniques in a manufacturing environment. Drawing on his years of working with hospitals, Mark Graban explains why and how Lean can be used to improve safety, quality, and efficiency in a healthcare setting. After highlighting the benefits of Lean methods for patients, employees, physicians, and the hospital itself, he explains how Lean manufacturing staples such as Value Stream Mapping and process observation can help hospital personnel identify and eliminate waste in their own processes — effectively preventing delays for patients, reducing wasted motion for caregivers, and improving the quality of care. Additionally, Graban describes how Standardized Work and error-proofing can prevent common hospital errors and details root cause problem-solving and daily improvement processes that can engage all personnel in systemic improvement. 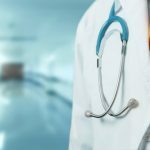 A unique guide for healthcare professionals, Lean Hospitals clearly elaborates the steps they can take to begin the proactive process of Lean implementation. Pascal Dennis is a Lean business learner and practitioner who has written four books on the subject of Lean business practices. In The Remedy, he shows how Lean business practices can be expanded from manufacturing to all the other areas of your business-including design, engineering, sales, and marketing and all processes in between-and how doing so builds a more efficient organization at every level. This story follows Tom Pappas and Rachel Armstrong, senior leaders at a desperate automotive company as they try to implement a Lean management system across an entire platform, the Chloe, a breakthrough “green” car. The future of the company is at stake. Can Tom and Rachel, supported by Andy Saito, a retired, reclusive Toyota executive, regain the trust and respect of the customer? Can a venerable but dying company implement Lean practices to every part of their business and learn a new, more effective way of managing? If your business is treading water-or sinking in the waves-The Remedy will show you how to put Lean processes to work in every functional area for long-term business survival and success. Increasingly popular with large and mid-sized companies around the world, Lean Six Sigma is the new hybridization of Six Sigma and Lean methodologies. Packed with diagrams and real-life examples, this book reveals the four keys of Lean Six Sigma and how to apply them to one’s job. Also included are the concepts, tools, templates, tips, examples, and implementation steps required to move through its process. Cutting through Six Sigma’s strange terminology and consultancy speak, this guide aims to remove the mystique by delivering Six Sigma in a down to earth, approachable and logical format. MINITAB®: For each tool, this guide details how to enter the data into MINITAB and interpret the results, whilst providing hints and tips to help avoid the common pitfalls. Interactive: Data files and templates for all the examples are available online Routemaps: A logical flow is provided through each DMAIC phase, and detailed routemaps are provided for graphical tools, hypothesis tests and Statistical Process Control (SPC) charts. Who should use this book? 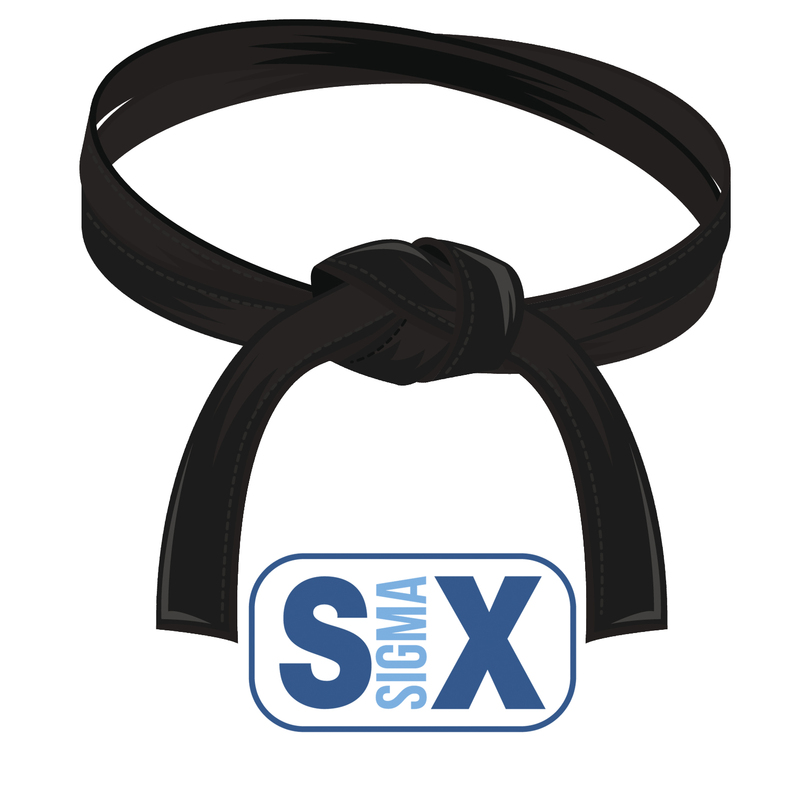 Six Sigma Trainees: Both during and after training, this guide provides an invaluable reference text to those who are actually implementing Six Sigma methodologies in an organisation. 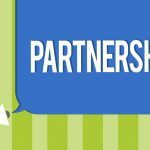 Six Sigma Project Sponsors and Managers: For those who are accountable for deploying Six Sigma throughout an organisation, but who might not have been Six Sigma trained, this guide will provide an overview and crash course in the tools and techniques that your project teams are trained in. In plain-English writing, this friendly guide explores the general overview of Lean, how flow and the value stream works, and the best ways to apply Lean to your enterprise. 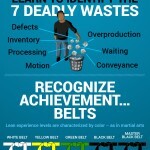 You will understand the philosophy of Lean and adopt it not as a routine, but a way of life. Managing to Learn by Toyota veteran John Shook, reveals the thinking underlying the vital A3 management process at the heart of lean management and lean leadership. Constructed as a dialogue between a manager and his boss, the book explains how A3 thinking helps managers and executives identify, frame, and then act on problems and challenges. Shook calls this approach, which is captured in the simple structure of an A3 report, the key to Toyota’s entire system of developing talent and continually deepening its knowledge and capabilities. The A3 Report is a Toyota-pioneered practice of getting the problem, the analysis, the corrective actions, and the action plan down on a single sheet of large (A3) paper, often with the use of graphics. A3 paper is the international term for a large sheet of paper, roughly equivalent to the 11-by-17-inch U.S. sheet. The widespread adoption of the A3 process standardizes a methodology for innovating, planning, problem-solving, and building foundational structures for sharing a broader and deeper form of thinking that produces organizational learning deeply rooted in the work itself, says Shook. Management expert James Womack predicts Managing to Learn will have a deep impact on the way lean companies manage people. 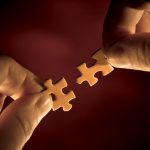 He believes readers will learn an underlying way of thinking that reframes all activities as learning activities at every level of the organization, whether it’s standardized work and kaizen at the individual level, system kaizen at the managerial level, or fundamental strategic decisions at the corporate level. A unique layout puts the thoughts of a lean manager struggling to apply the A3 process to a key project on one side of the page and the probing questions of the boss who is coaching him through the process on the other side. As a result, readers learn how to write a powerful A3 – while learning why the technique is at the core of lean management and lean leadership. Part case study, part manifesto, this groundbreaking new book by a doctor and a healthcare executive uses real-life anecdotes and the logic of lean thinking to make a convincing argument that a revolutionary new kind of healthcare — lean healthcare — is urgently needed and eminently doable. In On the Mend: Revolutionizing Healthcare to Save Lives and Transform the Industry John Toussaint, MD, former CEO of ThedaCare, and Roger A. Gerard, PhD, its chief learning officer, candidly describe the triumphs and stumbles of a seven-year journey to lean healthcare, an effort that continues today and that has slashed medical errors, improved patient outcomes, raised staff morale, and saved $27 million dollars in costs without layoffs. Find out: How lean techniques of value-stream-mapping and rapid improvement events cut the average “door-to-balloon” time for heart attack patients at two hospitals from 90 minutes to 37, What ThedaCare leaders did to replace medicine’s “shame and blame” culture with a lean culture based on continuous improvement and respect for people, How the lean principle of “building in quality at the source” broke down divisions among medical specialties allowing teams to develop patient care plans faster, Why traditional modern management is the single biggest impediment to lean healthcare, How the plan-do-study-act cycle coupled with rapid improvement events cut the wait time at a robotic radiosurgery unit from 26 days to six, How the lean concept of “one piece flow” saved time in treating ischemic stroke patients, increasing the number of patients receiving a CT scan within 25 minutes from 51% to 89%, How senior leaders at other healthcare organizations can begin their own lean, transformations using a nine-step action plan based on what ThedaCare did — and what it would do differently, Toussaint and Gerard prove that lean healthcare does not mean less care. On the Mend shows that when care is truly re-designed around patients, waste and errors are eliminated, quality improves, costs come down, and healthcare professionals have more time to spend with patients, who get even better care. Get your copy of this important new book today. A successful Kaizen Event can only occur if team members feel and have ownership of what is being improved. Even though the outcome of the event may improve their daily work activities, just by them being on the team does not guarantee ownership. However, the writing by each team member in this book will help to contribute a new sense of ownership – that necessary ingredient in any successful Kaizen Event. They will feel more part of the team. The Lean Pocket Handbook for Kaizen Events is your personal (i.e., individual) Lean planner for the 21st century. We have found individuals that use this pocket handbook feel more part of the Kaizen team. They also continue to contribute improvement ideas well past the formal team Kaizen Event. That is what Lean is all about – making those small, incremental, improvements daily (i.e., hour-by-hour and minute-by-minute) by those closest to the process. This handbook is designed to be: 1. A quick-reference guide. 2. Your individual (i.e., personal) log. 3. Your personal Kaizen planner. 4. A tool to self-initiate Idea Kaizens. 5. A learning tool. Each topic will have 4 pages. The first page will define the tool and provide a brief description. The second page will provide a simple flowchart of how that tool can be used effectively. This flowchart is meant to serve as a catalyst (and guideline) to stimulate ideas for the possible use of that tool in the Kaizen Event. The third page will provide illustrations demonstrating the tool as it is being used. This page will also contain an area for any notes that may be taken. The fourth page will be your personal Lean log and planner. This page is meant for you to write anything and everything down that you must do in support of the Kaizen Event. Idea Kaizen references can be noted here for investigation and implementation at a later date. Capitalize on a Powerful, 10-Step Improvement Process to Identify and Solve Supply Chain Problems in Industrial Organizations! Six Sigma practitioners and industrial managers who want to improve supply chain effectiveness in their organizations now have a powerful new weapon to add to their arsenal! Lean Six Sigma for Supply Chain Management offers a unique 10-step improvement process for identifying and solving the root causes of supply chain problems in everyday operations. 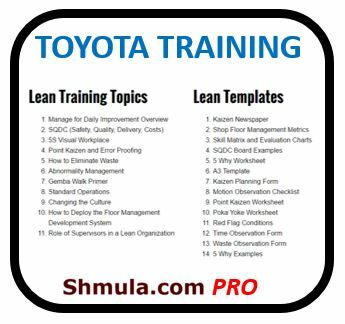 Written by Master Black Belt James William Martin, this proven management tool combines key aspects of Lean Manufacturing (from the Toyota Production System) and Six Sigma management principles in order to create a Lean Six Sigma approach that can dramatically improve supply chain function. Lean Six Sigma for Supply Chain Management contains specific information for developing inventory models, metrics for aligning objectives with strategic goals, a concise overview of supply chain concepts, and models illustrating how lead time and demand impact customer service and inventory investment levels. This vital resource features: A complete program for Lean Six Sigma improvement and control, The latest Lean Six Sigma methods to identify and manage supply chains, Expert help with Lean Six Sigma supply chains and third party logistics, Applications of Lean Six Sigma to MRPII, Guidance on root-cause analysis using Six Sigma tools, designed to help Six Sigma professionals, and frontline managers achieve higher levels of competitiveness, Lean Six Sigma for Supply Chain Management provides the guidelines, tools, and techniques required to eliminate supply chain problems and boost company performance. THE COMPLETE LEAN ENTERPRISE: Value Stream Mapping for Administrative and Office Processes Beau Keyte and Drew Locher This new book provides a step-by-step approach to applying lean initiatives to the office environment. This title is a must read for those looking to improve their production support activities by identifying waste, establishing performance metrics, speeding up administrative workflow, and improving office efficiency. At The Danaher Corporation, George Koenigsaecker led the lean transformations of both the automotive and tool groups. He also led The Hon Company’s successful lean conversion, which doubled productivity and tripled revenues, leading Industry Week to recognize HON on their list of the “World’s 100 Best Managed Firms.” Written to help executives in determining right from wrong during a lean initiative, Leading the Lean Enterprise Transformation shows that lean is more about an approach than it is about tools. It presents the successful strategies and case histories of several key American leaders who have been instrumental in bringing lean to the forefront of various industries. Organized in the chronological sequence that a leader embarking on a lean journey would experience, this lively work: Describes the simple, yet powerful, True North metrics used by Toyota and describes how they drive every line item in the good, direction, Explains the use of value stream analysis at the leadership level, Shows how to structure successful kaizen events that improve the value stream, Presents tactical organizational steps necessary to sustain double-digit improvements, Explores the development of a corporate assessment and review structure in support of a lean transformation, Introduces leadership tools such as strategy deployment, transformation value stream analysis, and transformation plan of care, lastly, the book discusses what may well be the least understood and most critical aspect of a lean transformation: the building of a lean culture. That ability is what separates the tactician from the technician. While many books exist that detail all the tools needed for a lean implementation, this book explains those tools needed at the enterprise level by executives, but more importantly it provides potential change agents with the skills to define, develop, and communicate a vision. It helps cultivate the willingness to innovate and learn by doing. Such a course is not for everyone, just leaders. Building on their breakthrough bestsellers Lean Software Development and Implementing Lean Software Development, Mary and Tom Poppendieck’s latest book shows software leaders and team members exactly how to drive high-value change throughout a software organization—and make it stick. They go far beyond generic implementation guidelines, demonstrating exactly how to make lean work in real projects, environments, and companies. The Poppendiecks organize this book around the crucial concept of frames, the unspoken mental constructs that shape our perspectives and control our behavior in ways we rarely notice. For software leaders and team members, some frames lead to long-term failure, while others offer a strong foundation for success. Drawing on decades of experience, the authors present twenty-four frames that offer a coherent, complete framework for leading lean software development. You’ll discover powerful new ways to act as competency leader, product champion, improvement mentor, front-line leader, and even visionary. Systems thinking: focusing on customers, bringing predictability to demand, and revamping policies that cause inefficiency, Technical excellence: implementing low-dependency architectures, TDD, and evolutionary development processes, and promoting deeper developer expertise, Reliable delivery: managing your biggest risks more effectively, and optimizing both workflow and schedules, Relentless improvement: seeing problems, solving problems, sharing the knowledge, Great people: finding and growing professionals with purpose, passion, persistence, and pride, Aligned leaders: getting your entire leadership team on the same page. From the world’s number one experts in Lean software development, Leading Lean Software Development will be indispensable to everyone who wants to transform the promise of lean into reality—in enterprise IT and software companies alike. 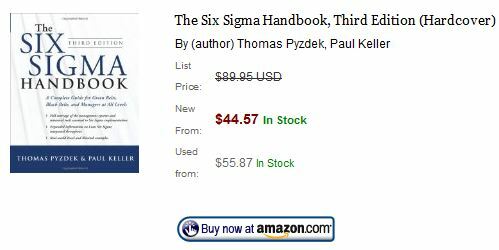 The Six Sigma Handbook, Third Edition is the only comprehensive reference you need to make Six Sigma work for your company. The book explains how to organize for Six Sigma, how to use customer requirements to drive strategy and operations, how to carry out successful project management, and more. Learn all the management responsibilities and actions necessary for a successful deployment, as well as how to: Dramatically improve products and processes using DMAIC and DMADV, Use Design for Six Sigma to create innovative products and processes, Incorporate lean, problem-solving, and statistical techniques within the Six Sigma methodology, Avoid common pitfalls during implementation. Six Sigma has evolved with the changing global economy, and The Six Sigma Handbook, Third Edition is your key to ensuring that your company realizes significant gains in quality, productivity, and sales in today’s business climate. The Gold Mine: a Novel of Lean Turnaround deftly weaves together the technical and human pieces of implementing lean manufacturing in an engaging story that readers will find both compelling and instructive. Authors Freddy and Michael Ballé have produced the first integrated and systematic approach to a set of ideas that have maximized value and minimized waste throughout the world. At the heart of the Gold Mine is Bob Woods, a curmudgeonly sensei coaxed out of retirement by his son Mike to help boyhood friend Phil Jenkinson save his struggling company. Despite terrific products and a backlog of orders, Phil’s company cannot generate enough cash from its operations to pay its bills. And so Mike enlists Bob to help his pal fix this crisis. “You’re trying to deal with your mess as if it was a technical problem,” Bob tells Phil. “Move this machine here, change this design there, which it is to some extent, but … it’s all about people. You have a leadership problem not just a production or business problem.” As Phil begins to tackle the key challenges necessary to improve his company’s operations, he comes to understand the deeper points of lean. Readers will also draw powerful insights from his journey. The Gold Mine presents all the key lean principles, ranging from well-known ideas such as pull and flow, to lesser-known yet equally important principles such as jidoka and heijunka. The book also reveals lean as a system—using a realistic story to show how the principles are interrelated and how they lead to useful tools such as kanban or 5S.